Here is pic of one messy install. First pipe on left, going down from gutter, is ground. The gutter is "utility sealed", contains service drop, and has all meter feeds splice to it. (Good use of tap rules, actually). So, each panel/ disconnect is a "main," yet there is only one service drop. From the looks of that backing board, the whole works will have to come down shortly. This is not too cool at all. BTW, what is that black wire heading away to the right?. Shouldn't it be in some sort of conduit?. Boy, do I have some explaining to do...I had NOT intended for this to be on the forum- simply because there are so many things to discuss! This is one of several such arrangenments at this very low-rent, nest of non-documented (read 'illegal') immigrants. The owner- a good customer of mine- specialises in buying these sorts of places, and re-developing (bulldozing) them. The picture is best described as an examply of how things were done a long time ago, and there's not been a dime put into improving it since then! Rest easy, Trumpy, the black cable you mention is for the cable TV. Typical for THEIR workmanship, I'm sorry to say. 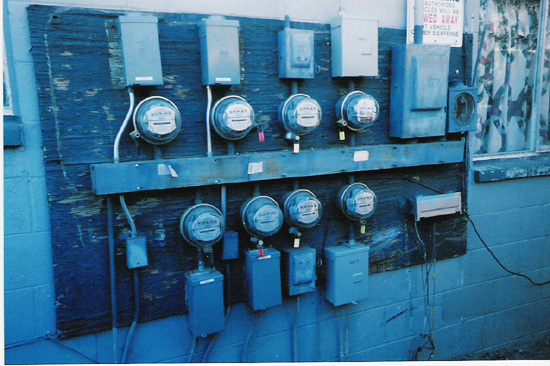 By now, all the fuse boxes have been replaced with circuit breakers; no more over-fusing. The deterioration of the backing board is a good illustration why I don't like to mount things on boards. I don't seem to have the trouble anchoring in concrete that some seem to have! The central gutter is a NEMA-1 (indoor), closed with screws and "sealed" with PoCo stickers. I assure you, practices have changed! Today, a similar set-up would have an outdoor-rated gutter mounted high up, and have a proper utility seal. The panels would be connected to the ground without returning to the gutter. There are also two examples of customer-side wires passing through the utility-side gutter. So much for the seals!